Two recent agreements that boosted CHI Franciscan Health’s presence on the Kitsap Peninsula brought rising prices for patients and reduced competition, according to a new lawsuit filed by the state attorney general. 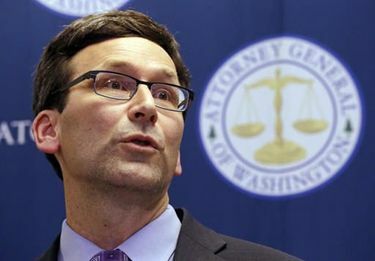 Attorney General Bob Ferguson wants the court to undo the agreements between Franciscan and two medical firms: WestSound Orthopaedics and The Doctors Clinic. The lawsuit filed Thursday names all three as defendants. “These transactions were intentionally made to decrease competition, increase prices, and pad CHI Franciscan’s bottom line at the expense of its patients,” Ferguson said in a news release. The lawsuit, filed under seal in U.S. District Court for the Western District of Washington in Tacoma, said the agreements violate state and federal antitrust laws. Franciscan will “vigorously defend” its case and “believes that the AG’s allegations are misguided and unfounded,” Evans wrote. Insurers saw double-digit price increases overnight, according to the AG’s news release, and those increases were passed to patients as out-of-pocket costs. But the AG’s office said patients on the Kitsap Peninsula now have fewer options for health care since the merger took place. “The transactions have hobbled CHI Franciscan’s competitors while allowing it to reap the benefit of more expensive, hospital-based rates” at Harrison Medical Center in Bremerton, the attorney general’s news release stated. CHI Franciscan has “netted well over $1 million in ill-gotten gains” since the mergers last year, and the attorney general alleges a “price-fixing agreement” between CHI Franciscan and The Doctors Clinic. The state is asking the court to force CHI Franciscan to pay back the overages, pay civil penalties and court costs, and rescind both agreements with the medical providers. The hospital system is part of Denver-based Catholic Health Initiatives.